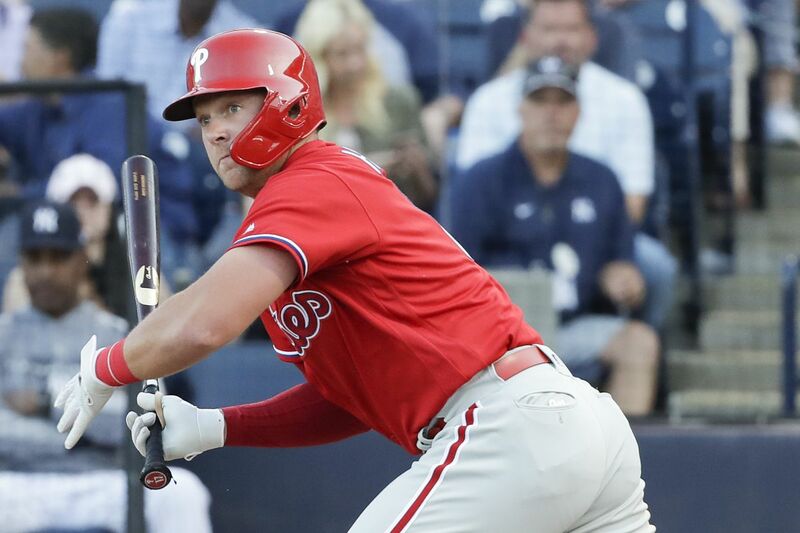 Rhys Hoskins will miss a few games this week because of soreness in his left shoulder. CLEARWATER, Fla. -- When Phillies officials review the team’s depth chart, they see only one name listed at first base: Rhys Hoskins. It’s notable, then, if not overly alarming, that Hoskins will miss a few games with what manager Gabe Kapler characterized Wednesday as “mild” left shoulder soreness. An MRI exam Tuesday didn’t reveal any structural damage to the shoulder, according to Kapler, who said the Phillies have “no concerns” that Hoskins will be ready for the season-opener against the Braves on March 28 at Citizens Bank Park, a sentiment echoed by the slugger. “Not in question,” Hoskins said of his status for opening day. Hoskins, who noticed the soreness after an “awkward” swing in his final at-bat Sunday, won’t play through at least Friday night in Tampa against the Yankees and probably not until Sunday against the Orioles in Clearwater. If Hoskins did miss extended time, third baseman Maikel Franco would move to first base, Kapler said. Franco has played nine games and made six starts at the position, including one last season. He is scheduled to play first base on Friday night. Sean Rodriguez played first base Wednesday and went 0-for-3 with three strikeouts in a 3-1 loss to the Tigers. A utility infielder with extensive major-league experience, he is in camp as a non-roster invitee and can ask for his release if he isn't added to the 40-man roster by Saturday. Rodriguez is 3-for-38 this spring. Andrew McCutchen will begin the season as the Phillies' leadoff hitter. "I love his profile up there," Kapler said. "I love his ability to see pitches. I love his history of [getting] on base." Kapler also said he prefers to split up the right-handed hitters in the middle of the order. When switch-hitting Cesar Hernandez leads off, righty-swinging Hoskins, J.T. Realmuto, and McCutchen would likely bat back-to-back-to-back in the 4-5-6 slots. Hernandez, the Phillies’ primary leadoff man over the last few seasons, will bat lower in the lineup, with lefty-hitting Odubel Herrera and Franco, a right-handed hitter. Pivetta is in line to start the season’s second game against the Braves, on March 30. Jake Arrieta will start on March 31, a nationally televised Sunday night game. Bryce Harper notched his first hit in Grapefruit League play in the fourth inning, a single to center field. He’s now 1-for-10 in six games. He will play again Thursday, take Friday off, and play right field Saturday, Sunday, and Monday, before the Phillies break camp. … Arrieta threw 82 pitches over six innings in a game against Blue Jays’ minor leaguers, including prospects Bo Bichette and Cavan Biggio, sons of former major leaguer Dante Bichette and Hall of Famer Craig Biggio.